The radiometers that first set the standard for the industrial UV curing industry now have the ability to be used with display or as a profiling radiometer that transfers the irradiance profile to a computer for analysis. Easy to Use: Single Button for On/Off and Run Mode makes it easy to collect and view data. Data Mode: Uv data (joules/cm2, watts/cm2) displayed on one screen for up to 4 bands. 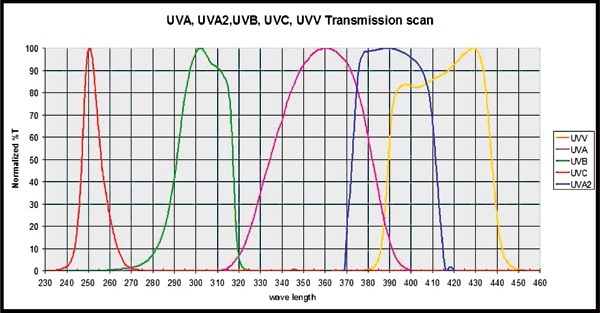 Graph Mode: A graph illustrating the collected UV irradiance and energy is displayed for each of the UV bands. 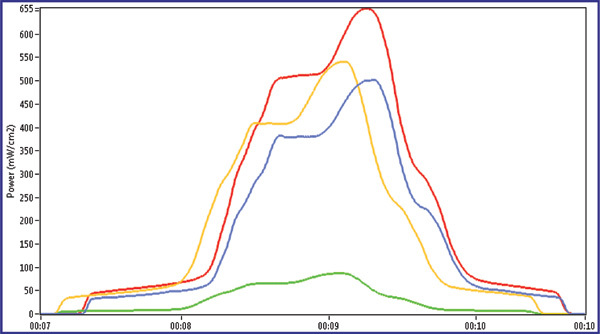 Graph shows the irradiance profile as a function of time (mW/cm2 on y-axis, time on x-axis). Reference Mode: Allows the user to store a run into the instrument memory to allow for easy comparison to current UV conditions. Setup Mode: Soft buttons are used for function selections, and are indicated on the bottom of the display for easy operator selection and use. User can decide what screen mode & units to display and also select the sample rate. Smooth On: Compatible with previous sampling rate on legacy Power Puck units sampling at 25 samples per second. Smooth Off: Compatible with UV PowerMAP sampling rate at over 2000 samples per second. profile information easily available on the display. 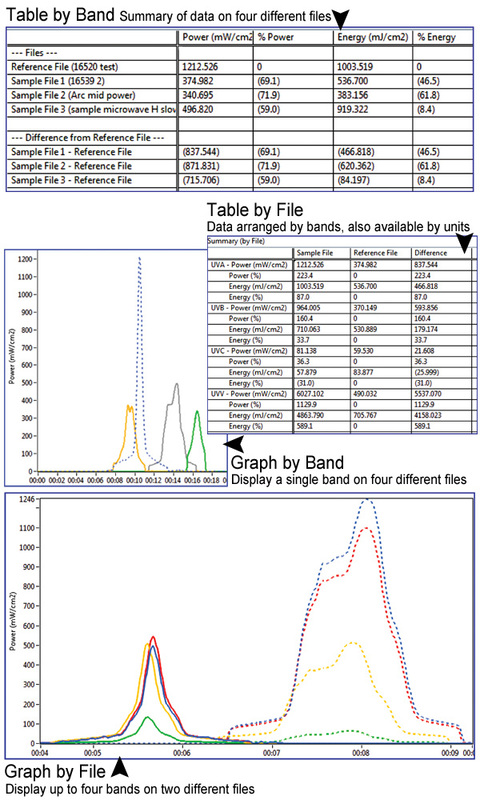 Profiler Mode adds the ability to transfer the irradiance profile and data to a computer for further analysis and evaluation. The UVICURE Plus II or UV Power Puck II instruments are available in three dynamic (operating) ranges. The standard range (10 Watt) works well for high power curing applications. The mid-range (1 Watt) works well with low power arc lamps and in applications with lamps that are non focused or away from the cure surface. information. Select from templates & text or customize to your needs. EIT has sourced an industrial grade optics wipe that can be used for cleaning the optics on our UV measurement products. Careful cleaning of the outer optics will help your EIT instrument perform as designed between service intervals. Examine the instrument to determine if it needs cleaning. Carefully blow or brush loose particles away from the optics. Handheld bulbs to blow air are available from camera stores. the optics. Short bursts from a distance will minimize the transfer of any additives from the 'canned air' to the optics. If using compressed air, make sure it is oil free, "instrument grade" air. 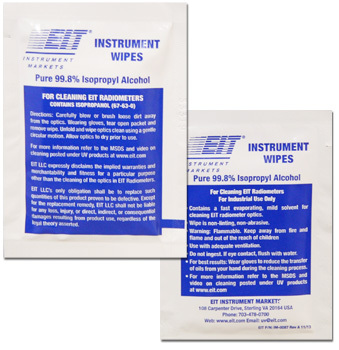 EIT suggests the use of gloves to prevent the transfer of oils from your hands to the wipes and possibly to the optics of the instrument. Handle the gloves from the wrist and not the part of the glove that will hold the wipe. Once the sealed package is opened, the wipe can be unfolded and the optics cleaned with a gentle circular motion. We suggest bunching a small section of the wipe to start. Move to different areas of the cloth wipe and bunch new sections as you clean. The Wipe is large enough that you may be able to clean multiple instruments. Properly dispose of the wipe. This equipment is in conformity with the following standards and therefore bears CE marking: IEC 61326-1:2005, EN55011:1998, EN61000-4-2:1995, A1:1998, A2:2001, EN61000-4-3:2002, A1:2002, following the provisions of the applicable directives: 98/34/EEC and amendments, 89/336/ EEC and amendments.